Hope's Cafe: Perri's Leather Paddock Boots-Review and Giveaway!! Perri's Leather Paddock Boots-Review and Giveaway!! Well, today's review and giveaway is aimed mainly at horse riders and owners, there are many other people who may enjoy this as well. I have owned 2 horses in the past, and before that I mucked out stalls in exchange for horseback riding trips :) Now, unfortunately, I can't keep a horse where we live, so I ride at a friend's house. But, even before I ever rode a horse, I loved wearing paddock boots. Okay, a lot of it was probably just that boots were associated with horses, but even now I wear paddock boots a lot more places than just out at the stables! They are so comfortable, yet very stylish looking! So, that's what I mean when I say even if you don't own or ride a horse, you'll still like this company! "Originally founded in 2000, Perri's Leather was based on a sincere desire to create a company that provided equestrian products that were a great value to both the retailer and the consumer. Recognizing a need within the marketplace to produce quality leather goods, (halters, bridles and training equipment,) the foundation of our company was laid. Perri's Leather, from its inception, specialized in (1) carrying a broad product line of staple items retailers must have in stock, (2) personalized service and (3) prompt delivery of orders. These are the cornerstones of our company. Today Perri's is proud to be carried by over 850 retail stores in the United States as well as Canada." Perri's Leather generously sent me a pair of their Synthesized Leather Paddock Boots for review. These boots come with either zipper or lace, and black or brown. I chose the lace-up brown boots. I have only worn zip boots once, and found I preferred lacing my boots. These boots are sooo nice! I don't personally wear spurs while riding, but they have a spur rest for those who do. These boots come up a little higher than my last pair of paddock boots, and I like the extra support it gives. In addition to the laces in front, there is also a zipper and snap in the back. I have to say, these are some of the most comfortable paddock boots I have ever worn, and they are very reasonably priced! The boots are easy to clean off with a rag if they get dirty while riding/cleaning stalls out, etc. I really can't say enough about how pleased I am with these! Booted up and ready to ride! So, if there's a horse-lover in your life, why not check out Perri's Leather today?! They have a great assortment of riding apparel and footwear, as well as horse grooming products, riding crops, halters, lead ropes, and barn supplies! 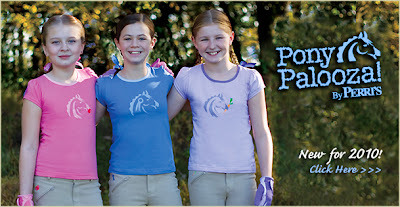 I absolutely love the Pony Palooza section, where you can find all sorts of children's riding gear, apparel, and supplies! And, the best part (for all of you) is, Perri's Leather is giving a pair of Synthetic Leather Paddock Boots to one of my readers! Go to Perri's Leather and tell me another product you like!! 2 entries-Sign up for the Perri's Leather newsletter! (Bottom of home page). Leave 2 comments. This giveaway ends Friday, November 5, 2010 at 11:59 p.m. Please leave a valid email address in each comment, as this is how the winner will be notified. Winner will have 48 hours to respond, or another winner will be chosen. Giveaway open to US residents only. Disclaimer:I was not monetarily compensated in any way for this review. I did receive product for the purpose of review. All thoughts and opinions are mine. All quotes taken from the Perri's Leather website. I like the Ladies Schooling Jersey. Please enter me. Thanks! Entered the Marie Madeline Giveaway. Entered the Outdoor Education giveaway. Entered the Oh So Girly giveaway. I love the look of the Premium Suede/Elastic Half Chaps! I like the Ladies Riding Coat! I really want to win this giveaway! I follow on Twitter. PI of Products. I entered the Denim Skirt giveaway. I like the bracelet with engraved plate.